Throughout this week we will be celebrating the centenary of the tank with a series of blogs looking at armoured warfare over the past 100 years. In this first instalment David Fletcher, author of the recently published British Battle Tanks: World War I to 1939 and a number of books in the New Vanguard series, examines British tanks in World War I.
Tanks went into battle for the very first time on 15 September 1916 on the Somme. They later came to be known as Mark I tanks although their crews invariably referred to them as Cars or Buses. They were the only type available and came in two versions, male and female. You could tell them apart by the fact that the male tanks carried a long six-pounder gun in each sponson, while the females had different shaped sponsons, each armed with a pair of Vickers water-cooled, heavy machine guns of .303 inch calibre. Inside each tank was the same, except for ammunition stowage which was arranged to suit each version. Power was provided by a six-cylinder, 105hp petrol engine by the Daimler Motor Company Ltd of Coventry (British Daimler) which drove into a two-speed gearbox and then through a Daimler differential to auxiliary gears in the track frames. These provided two extra speeds and were also used for steering. Each tank towed two wheels behind it on a short frame which were used for steering but were easily damaged. Each tank had a crew of eight; a driver and commander sitting side by side at the front, four men to act as gun crew, two each side; either a gunner and loader for a six-pounder or machine-gunners in female tanks and two men detailed as secondary gearsmen, stationed nearer the back. The Mark IV tank was introduced in 1917. It weighed about 28 tons and had the same engine and driving arrangements inside as the Mark I, although the wheeled tail was no longer fitted. The Mark IV however had thicker armour and although there were again male and female versions (with Lewis machine-guns instead of Vickers), new designs of sponson (and shorter six-pounder guns) were fitted and were made to fold inside the tank to narrow it down for rail travel. On the Mark I you had to unbolt the sponsons and lift them off for train journeys, the sponsons travelling separately. A female Mark IV tank C14. Photographed with German Forces after the Battle of Cambrai. Mark IV tanks were used from the summer of 1917, at the Third Battle of Ypres and later, with more success, at Cambrai on 20 November 1917. In fact although theoretically replaced by more up to date models, so many Mark IV tanks were built that they remained in service until the end of the war. The next British heavy tank to see service was the Mark V which first appeared in the summer of 1918. Although it looked similar to the Mark IV from the outside, inside it was quite different. A new six-cylinder engine rated at 150hp and designed by Harry Ricardo, but petrol again, drove through a four-speed gearbox into steering epicyclics in the track frames designed by Walter Wilson. From the outside there were differences: there was an extra box-like cab on top of the hull with a prominent semaphore signalling device alongside it and ventilation louvres on the sides of the hull. Once again there were male and female versions only this time an air-cooled Hotchkiss machine-gun had replaced the Lewis. Mark V male tank with short 6-pounder Hotchkiss gun in right sponson. A longer version, known as the Mark V* was also introduced in 1918. Six feet had been added to the hull so that the tank could cross wider trenches, although since it had the same engine it was a bit slower than the Mark V and less manoeuvrable. Yet again there were male and female versions. 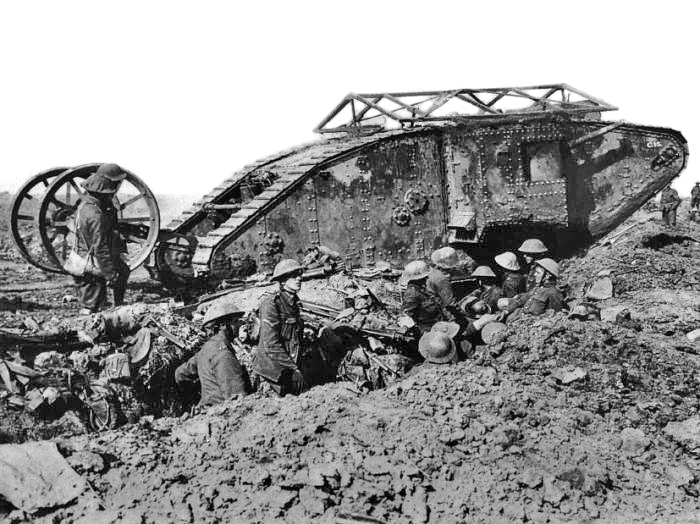 Mark V tanks fought at the Battle of Hamel (4 July) with the Australians while Mark V and V* tanks were used at the historic Battle of Amiens on 8 August 1918. 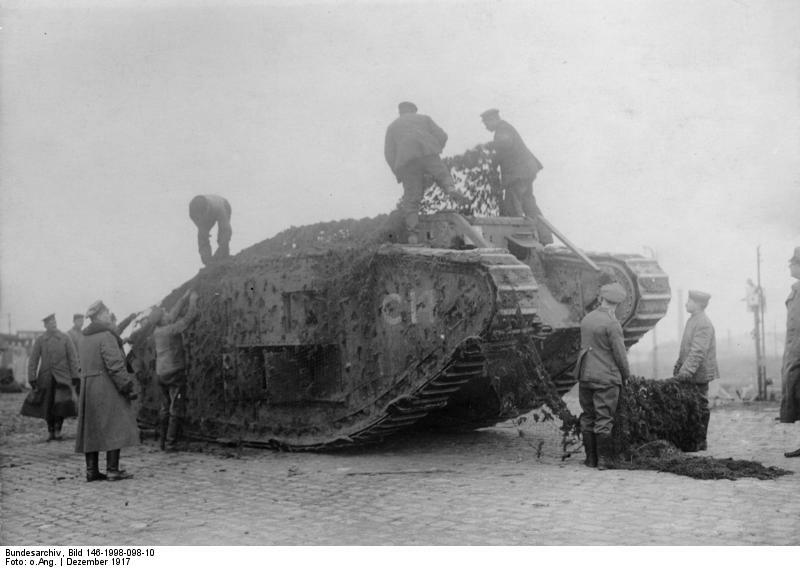 Both types were also used at the Second Battle of Cambrai at the end of September 1918, but the number of serviceable tanks available was shrinking fast, although the Great War was nearly over. The other type of British tank to see war service was the Medium Mark A, or Whippet. Totally different from the heavy tanks it was, in some respects more difficult to drive, Although a prototype, known as the Tritton Chaser, was demonstrated in March 1917 it did not enter service until early 1918. With a skilled driver it was fast, about 8 mph maximum and a lot more manoeuvrable although it had an unfortunate reputation for trying to roast and asphyxiate its crew. As a result, two crews of three men were in service with each tank, operating on alternate days. There was no male version of the Whippet, the tank was armed with three Hotchkiss machine-guns and like all British tanks in the First World War it had no sprung suspension at all. It just bumped and rattled over the ground. David Fletcher's latest book, British Battle Tanks: World War I to 1939, was published last month. Click here for more details.